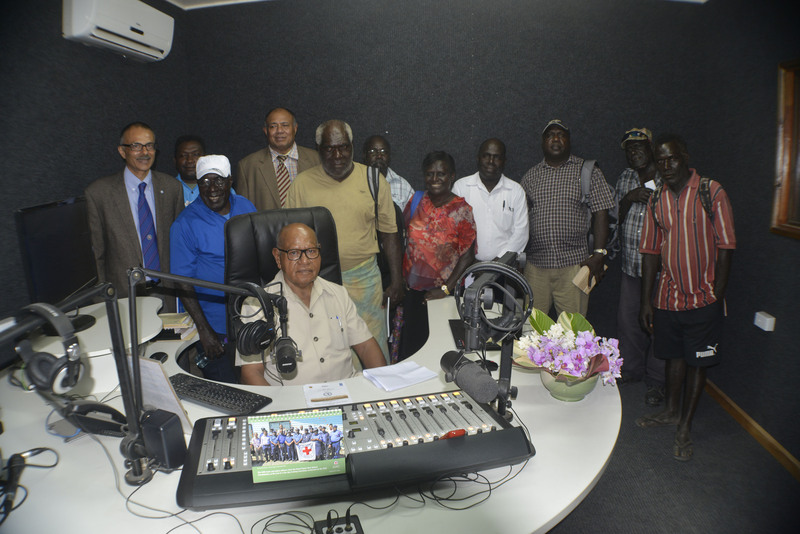 Pic Caption: ABG President Grand Chief Dr John Momis (seated), with UNDP reps, chiefs and local leaders at the official launching of the upgraded NBC Bougainville studios last week. The Autonomous Bougainville Government is making headway in developing the media in the region to allow people more access to information. This move has seen the upgrade of the NBC Bougainville facilities where the ABG committed K5 million to improve the coverage and broadcasting of the radio station. In opening the facility ABG President Grand Chief Dr John Momis said this included the procurement of new studio broadcast equipment, renovation to the Hutjena studio, procurement of a brand new fully digital 10 kilowatt shortwave transmitter. We intend to embark on a region wide awareness campaign working closely with Constituency members, Communality Government, Village Assemblies, Women, Youth and Churches. Momis added that the Bureau of Public Affairs, Media and Communication has so far produced and air 160 radio programmes since February to August 2016. These radio programmes have been well appreciated by the people as they gain insight and understanding on what the government is doing at Department and Ministry level. Another important development is the ABG’s very own Bougainville Bulletin which has progressed well with well over 150,000 copies distributed all over Bougainville since 2015. President Momis also revealed that the ABG has started developing resource material to support awareness on the Bougainville Peace Agreement and especially Referendum. The UNDP as per the ABG’s request has supported the government with the procurement of equipment. The equipment will be utilised to conduct awareness at the community level and includes a new information center based in Buka Town with literary material and a mobile audio visual vehicle convinently named Piksa Ples Lain.